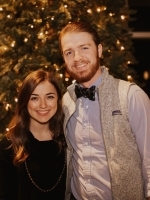 We are excited to welcome our new Student Pastor Justin Lewis and his soon to be bride Adrian Steward. Justin comes to us from Southaven Mississippi. Justin is a graduate of Blue Mountain College and is currently working towards his M.Div. Justin is a fan of Ole Miss (don’t hold that against him) and he loves sports. Even though he has a passion and love for sports his greatest love is for Jesus and then Adrian. We are excited to welcome Justin as he will begin his ministry in early February. Adrian will join him at PRBC later this Summer after they wed.